Acer has announced two new Acer Aspire One netbooks featuring high-definition screens, full-sized keyboards, multi-gesture touchpads and 3G connectivity. The new models, named AO751h and AOD250, are thinner than their predecessors with a one-inch thick body, both weigh less than three pounds and are available in four different colors: Diamond Black, Ruby Red, Sapphire Blue and Seashell White. Pricing starts at $349.99 for the 751h, and $298 for the D250. Both devices come with 802.11 b/g Wi-Fi and the company says select models are available with optional 3G connectivity. Other shared specs between the include 1 GB DDR2 RAM, 160 GB SATA hard drive, Acer Crystal Eye Webcam, three USB 2.0 ports, Multi-in-1 Card Reader, dedicated SD Card slot, and Windows XP with Service Pack 3. The 751h and the D250 come packing Intel's 1.6 GHz Atom N270 processor, but you could also load the 751h with Intel's Atom Z520. According to Acer's press release, the Z520 runs at 1.22 GHz, but what has me scratching my head is that Intel has always said the Z520 runs at 1.33 GHz. Regardless, the Z520 is definitely a slower chip than the N270, but makes up for it with much lower power consumption and support for Intel's VT virtualization technology-- the N270 does not support Intel's VT. Weighing in at 2.75 pounds, the AO751h leads the way in Acer's new lineup with an 11.6-inch LED high-definition screen with a 16:9 ratio and full sized keyboard. If you're looking for a multi-gesture touchpad, the 751h will let you pinch, flick and swirl your way through Google Earth and other gesture-capable programs. For battery life, it's your choice of a 3- or 6-cell battery that Acer says will last up to four or eight hours respectively. The smaller AOD250 comes in at 2.44 pounds, with a 10.1-inch LED screen with a 16:9 ratio and 1024x600 resolution. Acer says the D250 will last up to three hours and 15 minutes with a 3-cell or up to six hours with a 6-cell battery. The D250 doesn't come with a full-sized keyboard, high-def screen or multi-touch; instead the D250 is geared towards people who want a lightweight yet capable netbook. This is the second time Acer has refreshed its Acer Aspire One line this year. In March, PC World's Darren Gladstone gave the Aspire One AOD150 a PC World rating of 83 for its impressive battery life and big, bright screen; however, Gladstone complained the D150's mouse was a little unresponsive. The original Linux-powered Aspire One was one of the earliest low-cost netbooks to hit store shelves along with models from Asus and MSI. In October 2008, Acer released a Windows-based model that received a PC World rating of 80. Acer is becoming a big leader in the super-hot netbook market; the company says it shipped 1.8 million devices in the first quarter of 2009 and claims 30.5 percent of the netbook market worldwide. 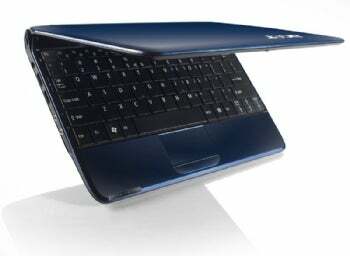 "How to Buy a Netbook" and PC World's "Top 10 Netbooks"